Hot Tub. Pet Friendly. Luxury. Wifi. DishTV. Pool Table. Mountain View. Firepit. 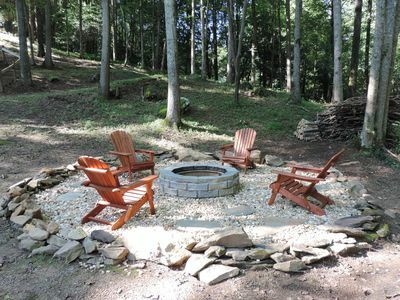 Fireside Lodge is the happy union of rustic countryside with all the comforts and amenities of a modern, luxury lifestyle. Don't wait another second. 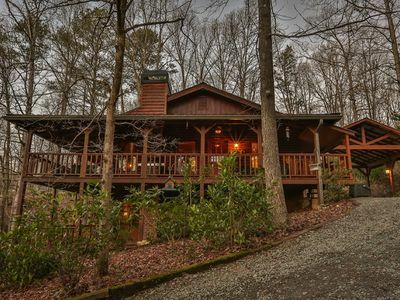 Come on up and regain some sanity in the North Georgia Mountains of Ellijay and Blue Ridge. 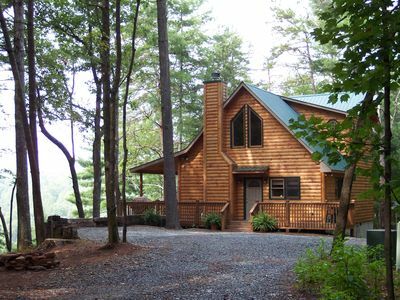 Fireside Lodge is a stunning 4 bedroom, 3.5 bath lodge that sleeps 8 and is dog friendly. 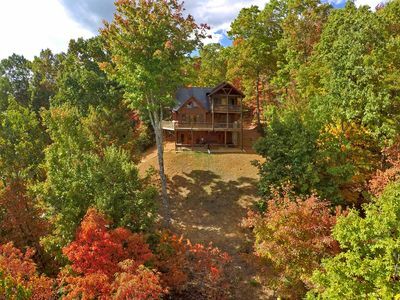 It’s a premier property with outdoor fireplace, huge fire pit, hot tub, long range mountain views, 8 wooded acres, gourmet kitchen, Internet, DISH TV, pool table, 60 game arcade, large game room with kitchenette, premium card table, Wii, 6 TVs, 5 DVD players, 2 DVRs , iPod/iPhone music player, and a huge library of DVDs , books, magazines, board games and puzzles. 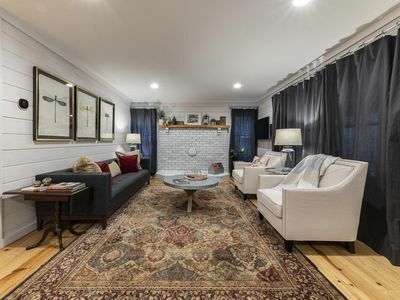 It’s a comfortable setting with total privacy – and beautiful and relaxing in any season, whether in lush spring and summer greenery, fall color, or winter’s calm. Inside, you’ll discover three beautifully decorated floors with every possible cabin amenity to ensure your stay is as relaxing – or activity packed – as you want. 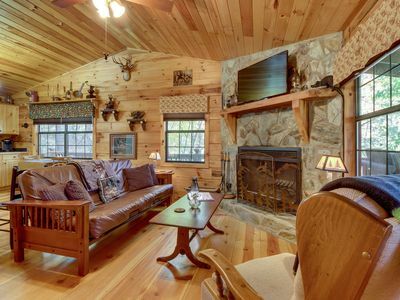 In the great room, lounge in front of the floor-to-ceiling stacked stone fireplace while watching a DISH movie or one of dozens of DVDS on the 46” TV. Get a little more active and play Wii. 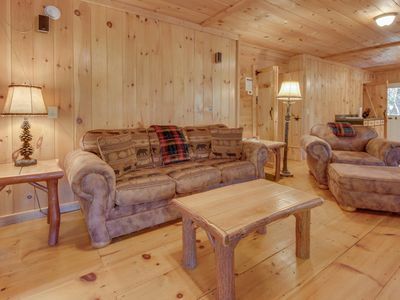 Or simply kick back on the sofas and admire the mountain views. Cook to your heart’s delight in the fully appointed gourmet kitchen with stainless steel appliances and granite counter tops. Step outside on the large covered deck to grill out, rain or shine. Play cards upstairs in the large loft with great mountain views – in your high-back leather chair at the championship card table. Head downstairs to the large, wonderfully decorated game room that has enough to keep everyone entertained. Challenge someone to a game of pool or darts. Or grab a stool at the massive, handmade Western-style log bar while watching a game on DISH TV. Listen to your favorite music on the iPod/iPhone music player in the background. Re-live memories of the 80’s by testing your skills on the 60 classic video games in the stand-up arcade. Then open the door to the luxurious 6 person hot tub where you can unwind and just gaze at the thousands of stars. 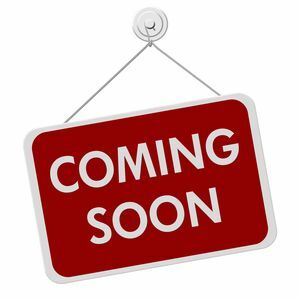 Downstairs is a completely furnished kitchenette with sink, a large refrigerator, microwave, popcorn popper, coffee maker, toaster, dishes, glasses/cups, and much more. Retire to one of the 4 premium bedrooms, including 2 Master suites with King beds. Master on main has a King bed as does the upstairs master. 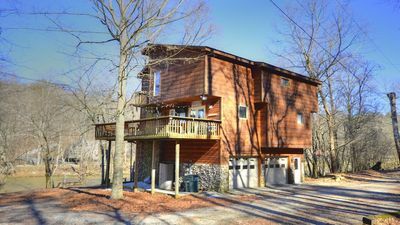 The upstairs Master has its own jetted tub with woodland views, private deck for star gazing, and great mountain views. Additional bedrooms on the downstairs terrace level have a King and a Queen bed. 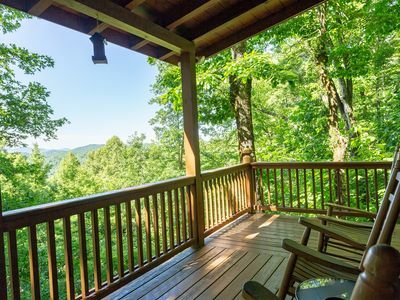 For the nature lover, Fireside Lodge is a certified wildlife habitat with the National Wildlife Federation. If you sit quietly and look carefully, you may see all types of wildlife including, deer, wild turkeys, rabbits, woodpeckers, raccoons, turtles , hawks, and more. Did we mention the gorgeous fall leaves? 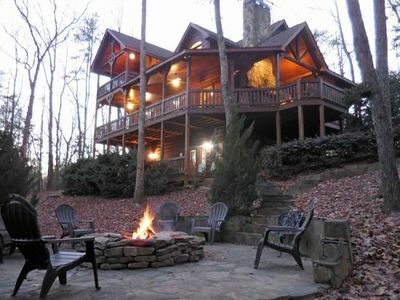 Fireside is located just 5 miles from Ellijay and about 15 miles from Blue Ridge on easy to navigate, high quality roads. 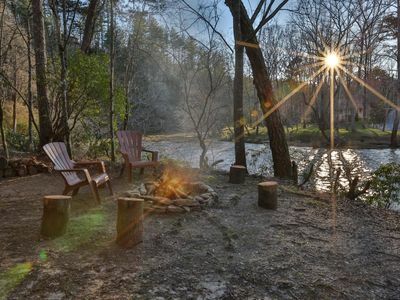 Fireside is close to apple orchards, wineries, horseback riding, hiking, fishing, swimming, Carter’s Lake, mountain biking, kayaking, whitewater rafting, river tubing, zip lining, quaint restaurants and shopping, even golf. Any activity you’d like to try is nearby! Bella Vista!!! 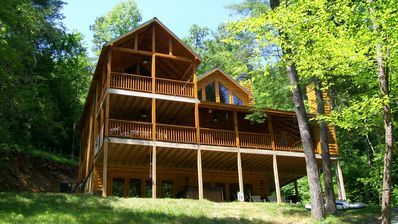 5/3 LOADED Pay for 2 nights, get 1 free! 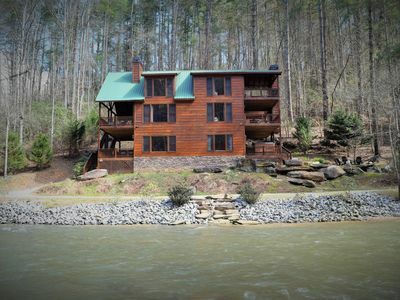 NEW-Beautiful Riverfront Cabin in Ellijay Gated Community-7th night free! 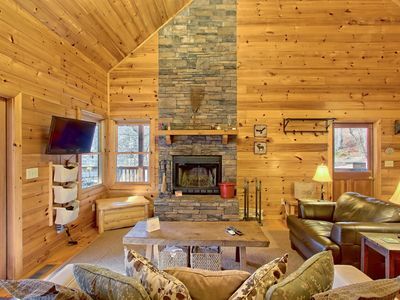 Cozy cabin w/ a hot tub, an air hockey table, and amazing mountain views! 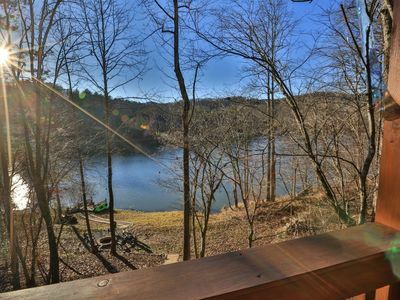 Riverfront home w/ hot tub, firepit & wrap-around deck - dogs welcome! 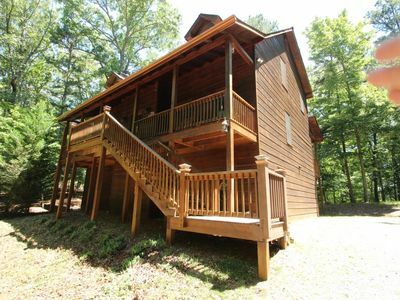 Dog-friendly cabin w/ furnished deck, private hot tub, & paved road access! 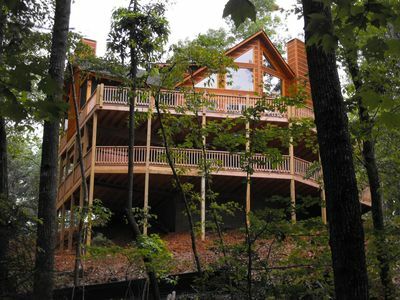 Rapid Retreat offers exposed beam ceilings and gorgeous, riverfront views of the Coosawattee River. 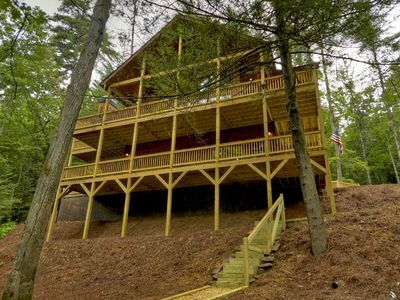 Authentic Creekside Log Cabin w/ Decks in Ellijay! 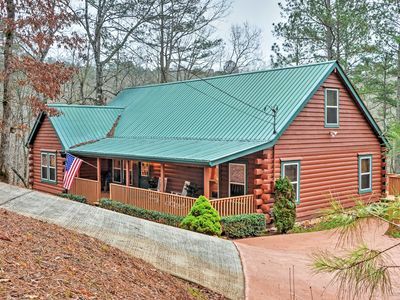 Great location mins to BR & Ellijay. 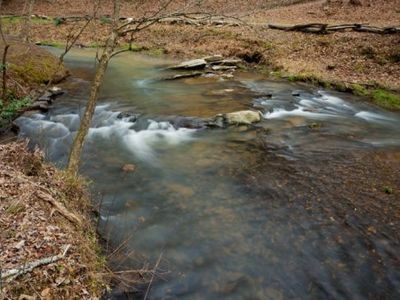 Hike/Bike to Rich Mtn/Aska Trails.